Unregulated suction dredge activity is unacceptable on New 49’er properties. Therefore we are hereby adopting the following Emergency Rules for the duration of this period of uncertainty. Please note that we have carefully crafted these Rules from the DFW suction dredge regulations which applied to our properties during the 2009 season when the illegal moratorium was imposed. We have modified them in consideration of concerns voiced during the San Bernardino legal proceedings, along with the ongoing drought situation in California. Please read this for a more thorough discussion of the difference between a “dredge” and a motorized suction system. 1) Suction mining in the active waterway, or within 100 yards of the active waterway, must not use a “suction dredge” as defined by California’s regulations (motorized pump generating suction through a hose to feed a sluice box) unless the operator possesses a valid California suction dredge permit. 2) No nozzle with an intake restriction ring larger than 4-inches in diameter may be used within 100 yards of an active waterway on New 49’er-controlled properties. 3) No excavation into the stream bank of an active waterway is allowed. This does not mean that bedrock cracks along the edge of a waterway cannot be worked. It means the bed material (rocks, sand and silt) must be left alone which rises up from the bedrock and creates a structure that holds the existing waterway in its path. This also means the stream bank may not be undermined or destabilized in any way. 4) Boulders and woody debris along the stream bank of an active waterway must be left alone. 5) Underwater suction mining without the use of a “dredge” is only allowed on our Klamath River properties between the Scott and Salmon Rivers on a year-round basis, and up the Klamath from its confluence with the Scott from the 4th Saturday in May through September 30. Underwater suction mining is permitted along our creek properties and the Scott River from July 1 to September 30. 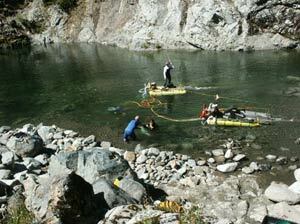 Underwater suction mining is permitted on the Salmon River from July 1 through September 15. 6) Underwater suction mining may not be pursued in any way that violates Water Quality standards, or exceeds Streambed Alteration standards. These are addressed in our Surface Mining Guidelines just above. Our members enjoy a great deal of privilege and freedom to operate on our mining properties. This is because we are a well organized and responsible group. We will be able to continue this as long as all of us conduct ourselves in a reasonable manner. These are operation guidelines which we have agreed to with the local agencies. They are very reasonable. This is a general outline. It does not include every single thing a person cannot do. It covers many of the main point’s members and guests should know about. It is up to each individual to keep informed. Important new information is posted on the Club bulletin board at headquarter offices, and on our web site at www.goldgold.com. Any member, or anyone else conducting mining operations on the forest that is not within these guidelines, is not included as part of our agreement with the U.S. Forest Service, and must negotiate your own program as a separate activity. Please keep a clean, orderly, organized camp. Make it look nice at all times! The local population and Forest Service know us by our appearance. Remember, your camp is a reflection upon the whole Club. It should not only look good by your standards, but also by anyone else’s standards. This includes having no cigarette butts, aluminum can tabs, bottle tops or trash lying on the ground around your camp. If you decide to use a camp spot, it is your responsibility to clean it up-even if it was messy before you arrived. Messy campers will not be allowed to camp on Club property. Please do not allow your garbage to build up. This causes a rodent and bear problem for you and other members-it also looks bad. Each member, guest or group is responsible for removal of all trash and garbage from the forest. Please do not dump your trash in the trash container at Club headquarters. There is a dump site located about one mile downstream from Happy Camp off of Highway 96. Please keep garbage and trash picked up from the surrounding area, even if it isn’t yours. Even if it is not the Club’s trash, because of our high visibility, we are going to be blamed for it. Please do your part to help keep our image clean. You cannot have campfires unless you have obtained a campfire permit from the Forest Service. Outside use of charcoal, fuel or gas stoves do require a campfire permit. Please adhere to all Forestry fire regulations. Stay informed, because fire danger levels can change daily during the summer months. Campfires may be prohibited in some camping areas, and during high-fire danger periods. Do not ever leave your camp with a campfire still smoking, or with any hot coals left (warm to touch with your hand). Smoking is allowed only in established campgrounds, in vehicles, on roads, on the river, or in the forest only if there is a 3-foot area cleaned all around. It is a must that you keep all cigarette butts picked up! Each and every individual person or group on our claims is responsible for the safety of the forest. If you start a forest fire, the authorities will require you to pay for ALL costs of putting the fire out, cleaning up afterwards, and the penalty for starting the fire in the first place. A big forest fire costs millions! Dead wood on the ground may be used as fuel for campfires. Trees cannot be cut down without a firewood use permit from the Forest Service. Any and all gasoline engines being run in the forest must have a Forestry-approved spark arrestor. This includes chain saws, electric generators, dredging and mining equipment. Some spark arrestors are available at our headquarters, but it is a good idea to make sure you have your spark arrestors before you arrive. Keep your gasoline in a safe place, where fire or cigarettes have no chance of setting it off. Please do not store an excessive amount of gasoline on Club mining properties. All sewage must be disposed of in enclosed containers and dumped in town at approved dump stations ( RV parks usually provide the service). Latrines and holes, for sewage of any kind, are not allowed. Portapotties and portable storage tanks are acceptable. The Club provides chemical toilets in heavily used camping areas only. You are required to provide your own toilet paper. Please do not dump your own portapotties or storage tanks or any garbage into the chemical toilets. Used bags from portapotties must not be dumped in our chemical toilets, as they plug the sewer hose on the pumping truck. These bags should be disposed of at the approved dumping stations in town. There are approved dump stations available in Seiad, Happy Camp and Orleans. Gray water must also be disposed of at an approved dumping station. MEMBERSHIP PAYMENTS must be paid current with the Club at any time any member wishes to conduct any mining activity on property administered by the Club. If you are behind, the girls in the office will work out a program with you to bring you current again. CAMPING AND PARKING Should not be done where any access roads will be blocked. Extended camping should be done only in designated campgrounds. Our campgrounds are marked on our maps and on site. No camping at Club headquarters. Members are allowed to camp in our long-term campgrounds if you are actively mining or prospecting and keep it clean. Forestry campgrounds and other places in the National Forest have a two-week limitation. Parking along the highway must be done as far off the road as possible, and always with the flow of traffic. Please do not park so as to block someone else in. All vehicles, when parked along Highway 96, must be parked at least 5 feet away from the white line on the side of the road. Be extra careful when loading or unloading vehicles, or when walking along the roadside, to give traffic plenty of space. The roads are narrow and mostly 55 mph. Please do not make drivers nervous by being careless. Please do not mine or dredge in any location where your holes or tailings will block or interfere with river rafters or boaters, river access ramps, or beaches used by the general public. RIVER ACCESS RAMPS: No motorized mining should take place within 100 feet of any river access ramp. Most of these river access points are well marked on the road with U.S. Forestry signs. LOCAL SWIMMING HOLES: There are popular local swimming holes on several of our Club claims. Several exist on the Salmon River, one exists on the South Fork of Indian Creek, and there may be others. Please do not prospect or mine within 200 feet of an established local swimming hole or beach. INSURANCE: All members and guests are encouraged to have an accident insurance policy in effect and on file with the office prior to participating in any mining operations on the Club’s mining property. We have a low-cost group policy available to members, if you do not already have an insurance policy of your own. Since members are legally responsible for your own operations and activities, we recommend that you also obtain a liability insurance policy to protect yourselves. All members and guests must sign and return the Club’s Membership Agreement before participating in any mining or prospecting activity on properties administered by the Club. REGISTRATION: All members and guests actively mining on Club properties must register with the office, and keep the office informed of your mining and camping locations. In addition to our tracking of assessment work to maintain the claims, we can also find you in case of an emergency, or should we need to reach you for any other reason. All members and guests engaging in activities on Club properties must have a membership card or guest pass in their possession. These cards are issued by our office in Happy Camp at the time that members and guests register. All vehicles being used by members on claims must have a Club membership decal on the front windshield. This especially includes camping trailers and motor homes being parked on Club claims and inside of Club extended camping areas. These stickers are freely available at the office in Happy Camp. Guests must display a guest pass on the dashboard of any vehicles they are using on claims managed by the Club. MINING & DREDGING SEASONS IN CALIFORNIA: Please refer to the New 49’er Rules concerning suction dredging. You will find details on mining seasons and dredge size limitations outlined there. Just in case you do not know, this new law only stops suction dredging within 100 yards of California’s active waterways. It does not have anything to do with the other types of prospecting or mining that we do in California. Unaffected prospecting activities include panning, sniping & vack-mining, sluicing & high-banking, electronic prospecting and other types of prospecting that do not use a suction system designed to excavate material off the bottom of an active stream, river or creek. It also does not affect our group weekend projects. There are no seasons imposed upon other types of mining activity which take place outside of the active waterway. In other words, you can do them at any time of the year. Please be advised that these other types of mining activity along New 49′er properties are subject to a our set of Surface Mining Operational Guidelines. OPERATING MOTORS IN RESIDENTIAL AREAS: Some of our claims are located near residential areas along the river. Members must yield to the requests of local residents to stop motorized mining operations at a reasonable hour. NEGOTIATING WITH OFFICIALS: Staying within these operation guidelines along with any limits outlined within our claims guide should allow members to be included with our formal Notice of Operations with the U.S. Forest Service when mining or camping on our mining properties located on the Klamath, Salmon and Scott Rivers, and Elk, Indian and Thompson Creeks. Anyone operating outside of these guidelines will be required to make your own arrangements (if necessary) along these waterways. Please be polite and courteous with local agencies and officials. We have invested a great deal of time establishing a mutual cooperative relationship; and we, as a group, have no problems or disagreements with them. If you have disagreements or dislikes for authority, please keep it to yourself or bring it to our Director of Internal Affairs. BOULDER REMOVAL: Please refer to the New 49’er Rules concerning suction dredging. You will find details on winching restrictions there. The Forest Service has placed fish weirs on our Thompson Creek claims near the lower bridge, and on our Elk Creek claims upriver from the 5-mile bridge. Please do not conduct any mining activity in or around these fish weirs. DREDGE DENSITY LEVELS: This is also addressed in the New 49’er Rules concerning suction dredging. Our agreement with local agencies is that no more than 10 dredges per mile of Club claims were allowed to operate along the Klamath River, or 5 dredges per mile on the Salmon and Scott Rivers. No more than 3 dredges per mile of Club claims are allowed on Elk, Indian and Thompson Creeks. Dredges are allowed on a first come, first served basis, but they must be operated to maintain a position along our claims. NO ABANDONED EQUIPMENT: Members may not leave mining gear, vehicles, camping gear or any other belongings on Club properties unattended for more than one week without prior written approval from the Club. Dry mining activities are allowed to the high water line. This is where the line of permanent vegetation (trees) begins. Our understanding is that a dredging permit is not required to use the suction assembly of a concentrator when working up on the bank some distance away from the existing waterway. However, if a sluice box is attached to the suction assembly, the device is classed as a “suction dredge” by the California regulations, and cannot be within 100 yards of an active waterway. Please see Special Rules for Underwater Suction Mining below. No amounts of sand, silt, gravel or other materials may be washed from (using water from a motorized pump) the bank into the active waterway. No surface mining activity is allowed that will erode or damage the existing bank of the waterway or cause a widening of the existing waterline of the existing waterway. ROPES AND CABLES ACROSS RIVER: Anyone stretching ropes or cables across the river must insure they are no less than ten feet above the water at all times. Eight feet on the creek claims. This is an important safety rule, especially on the Klamath and Salmon Rivers, where rafters, drift-boaters or jet boats are moving through on a regular basis. Please do not allow your cross lines to stretch and sag below this acceptable height above the water. If ropes are seen below the acceptable limit, and the owner is not present to raise them, please be advised in advance that the ropes will be cut to eliminate the danger to boating traffic. All cross lines (ropes or cables across the river) must be of a bright colored line. Yellow and/or white rope is preferred. This is so helicopter fire fighting equipment can see the cross lines. Dark colored rope cannot be used to string across the river. Steel cables must have bright colored rope along side, to show visibility of the cable. Because there are so many lines on the river, surveyors flagging is not permitted to show visibility of cables and rope (Wild and Scenic River). If a cable is to be attached to trees, pieces of wood or other material should be placed between the cable and tree, to prevent damage to the tree. Sometimes, when trees are not available on the bank to tie lines off to, some dredgers locate submerged rocks or obstacles to anchor their dredges out into the river. If underwater ropes are used, it must be done in a manner that your dredge floats directly behind the obstacle. Please do not tie off underwater ropes which extend diagonal or perpendicular to the river’s flow. Underwater ropes cannot extend out to the side of your dredge into the river. This poses a serious safety hazard to boaters, swimmers and other river users. FUEL: You must be extra careful to not spill any fuel into the active waterway from your gasoline engines when you are refueling them. Please do not bring any more fuel to your worksite than you need to use on any day of mining. Once your engine is refueled, you must secure the seal firmly on your fuel container, and place it well away from the waterway on a level area where there is no chance that the container can be knocked over. Please do not leave your fuel containers down along the edge of the waterway! No more than 25 gallons per motorized pump should be stored along any of the mining properties administered by the Club. All fuel should be packed around any set of river rapids, rather than floated through on a dredge, boat or raft. TOXIC MATERIALS: Any such materials must be neutralized and disposed of in the proper manner. OTHER TYPES OF LAND OR RIVER USERS are allowed to use the public lands as well. Be friendly to the rafters and fishermen. Their complaints to the local agencies cause us difficulty. Let’s please be hospitable. ORDERLY WORKSITES: Please keep your work areas orderly and free of excess equipment or other materials at all times. We are regularly inspected by the Forest Service, and are continuously observed by the hundreds of rafters along the river. Please make it look neat and professional! Do not cut trees or remove a significant amount of shade-causing vegetation from the banks of the creeks or river, without prior approval from the Department of Fish and Game. A minimum amount of brushing-removing underbrush-is allowed to improve a campsite or mining work area. It must be kept to a minimum. All mining equipment and support gear must be removed from the forest immediately upon the completion of a mining season. ACCESS TO WORK SITES: Please use existing pathways and trails wherever possible. Creation of any new trail that requires the cutting of brush must be approved by the USFS beforehand. Please do not rope or winch mining equipment up or down a hillside in anyway that will create erosion problems later. CLAIMING DEPOSITS: You must be actively mining in order to claim a deposit. Members and guests mining out of the water are allowed to claim a 60-foot diameter circle around the work site area. 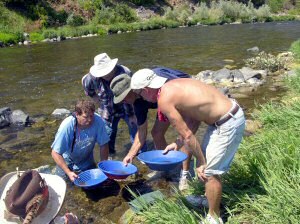 Each (actively mining) membership is able to claim 60 linear feet of the Klamath, Scott or Salmon River from one bank out to the middle when doing underwater mining, or 60 linear feet of Indian, Elk or Thompson Creeks. Claim boundaries should be neatly marked with flags or buoys. First come, first served. Please see the Club’s Information Booklet for more information on claiming deposits. No person is allowed to start an operation which will seriously hamper another prior existing operation. BOATS with engines must have the proper number of life preservers aboard, and must adhere to all other Coast Guard and law enforcement regulations. Members and guests may operate boats only in such a way as to not become a safety hazard to any other members or guests, or to any other river users or their equipment. No engine-powered boats with open propellers may be operated in such a way to endanger any swimmers or active dredgers. MINING EQUIPMENT, winches and other gear must be operated only in such a way as to not become a safety hazard to any other people or their equipment. CLAIM JUMPING: Our Club claim boundaries are well defined on our maps, with signs posted on each claim. If you cannot find our boundary sign, please inquire as to where the boundaries are located. It is fine to mine on property owned by others with their permission. Mining on property belonging to others without permission, or filing mining claims over top of others, causes the Club a serious public relations problem. STRUCTURES are not to be built on Club administered property. Anyone operating mechanized earth-moving equipment (like a backhoe) is considered a commercial operation. No members are allowed to conduct a commercial operation on Club claims without first signing the Club’s Commercial Contract. Commercial operations pay 10% of the total amount of gold recovered to the Club. This payment must be made at the Happy Camp office on or before each Wednesday for any and all gold recovered during the preceding week from claims managed by the Club. This payment, and report, must be made weekly, no matter how much or how little gold has been recovered on the operation. Commercial operators must keep accurate production records which will substantiate their 10 percent royalty payments to the Club. Floating memberships are strictly a working permit for crew members, and carry no other membership privileges-unless the membership is actually transferred to another person by paying the transfer fee and completing a membership form. The members in charge of a commercial operation must be present on the operation on a daily basis-not leaving the operation under the responsibility of crew who are not active members of the Club. Commercial members must take full responsibility of all crew and guests associated with the operation, making sure they are registered with the office, and making sure that crew and guests understand and adhere to the Club’s Operation Guidelines and Rules. CAMPING IN EXTENDED CLUB CAMPGROUNDS is a privilege that is earned by members who are actively mining, who keep a clean and organized campsite, who are not a burden to other members, and who follow all of the other operation rules of the Club. Extended camping on Club claims is by continuing permission of Club management. All members will sign an agreement with the Club that acknowledges the member will leave any Club campground, and remove all of the member’s belongings from the campground within 24 hours of being asked to do so by Club management. DRIVING ON DIRT ROADS: Drive slow and easy on dirt access roads to our claims. Some of these roads are narrow. Watch for traffic coming from the other direction. Dust control is a Forestry concern. USING EXISTING ROADS & TRAILS: Motor vehicles must remain on established road-ways. ATV’s must be kept upon established roads and trails, according to USFS regulations. MARIJUANA: Please do not grow any marijuana while participating as a member or guest of our Club. We do not want our mining Club associated in any way with the criminal element. If you spot marijuana plants, please leave them alone. Bring them to the attention of Club management and the local law enforcement. BREAKING THE LAW: Do not break any other laws while participating as a Club member. We do not want law enforcement agencies associating our Club as a problem source. This includes speeding, drinking and driving, fighting, poaching, etc. DOGS: All dogs are to be kept supervised at all times when on property managed by the Club. Continuous loud barking dogs, or mean dogs, in the designated campgrounds, will be required to be removed if they are bothering other members or guests. Problem dogs will not be allowed on Club property. If your dog bites someone, your membership will probably be terminated. Fish and Game regulations prohibit any dog from chasing any mammal in the National Forest. No dogs are permitted outside of vehicles at the potlucks, or onto the headquarter property in Happy Camp. FINANCIAL: Members participating in mining activity on Club claims must be financially able to support their operations. People who are constantly “broke and borrowing” will be asked to leave until they are more financially stable. FISHING: All members must obtain a fishing license prior to doing any fishing. The Game Warden will be looking in on members. He always checks people who are fishing. NOISE: Keep noise down before 8:00 a.m. and after 10:00 p.m. This includes operating dredges, generators, radios, loud meetings, etc., if it disturbs anyone else in the area. All engines being run in the forest should have proper noise suppression mufflers to prevent excessive noise. FIREARMS: No show of firearms permitted! Do not be strutting around with a gun at your side. Keep your guns inside and out of sight. No shooting within at least a half-mile of any mining or camping area or private property. Please do not shoot or harm the local animals! If you have a bear problem, clean up your camp first. If this does not work, notify the Club management or the Game Warden. The Game Warden probably will want to trap the bear and take it elsewhere. PRESERVING CULTURAL RESOURCES: Members and guests should be aware that there are numerous laws that prevent people from disturbing or taking items from Native American burial grounds, or other sites where significant cultural or historical resources are located. You must be very careful when digging or excavating in any area to avoid disturbing ancient human remains, or old items which may be of historical significance. It is legal to excavate and use electronic detectors in a prospecting operation while looking for precious metals. It may not be legal to excavate and use electronic equipment to find old items (junk or treasure) in the National Forest. Please keep your focus to prospecting. If your focus becomes distracted by other valuable items (like old bottles), know that you are treading in a gray area which is covered by antiquities laws that are not nearly as forgiving as the mining law. If in doubt, please talk with the Club’s Internal Affairs Officer or the U.S. Forest Service. PRESERVING WATER SUPPLIES: Please do not bathe in the creeks or river with soap or shampoo. Do not urinate in the active waterway while dredging. The creeks are domestic water supplies for people downstream! Please keep your animals-especially dogs-out of the creeks. POLITENESS: Please be polite and courteous to all locals, guests and tourists at all times. Remember, you are presenting an image of the Club when you speak to others. We would appreciate it very much if you do not engage in arguments on the Club’s behalf. This causes public relations problems that we will have to repair afterwards. Also, be polite and helpful to other Club members. Please do not lie about the gold you are recovering to keep other members out of the general area you are working! You already have the right to claim your deposit for yourself. This is a mining Club. As long as we are willing to help each other, we will all do better. Unfriendly members, who are discourteous to other members or guests, or who deliberately mislead other members or guests about the gold potential in Club areas, will be called in front of Club management. If you do not like being around other people, please go up into the more inaccessible areas of our claims and do your own thing. If you are not able to solve disputes or problems in a quiet, peaceful manner, please do not spread the problem to others. Bring the problem to the Club’s Director of Internal Affairs and he will help resolve it. No drunk, loud or disorderly conduct at the potlucks-or in our designated Club campgrounds. No member shall conduct him or herself in any way so as to be an embarrassment to the Club or other members. CLUB BUSINESS HOURS are marked on the office door. Please keep in mind that Club managers have personal lives and other business to take care of before and after normal working hours. We appreciate your consideration. No building or modifying equipment on office property, especially with the use of electrical tools (for liability reasons). Please do not get into equipment-building activity or extensive repairs on mining properties administered by the Club. PRIVATE PROPERTY: Some of our claims are located adjacent to private property. We have these areas marked as well as possible on our maps and on site. Do not trespass! DISAGREEMENTS: If you have disagreements or problems with management or the Club in general, rather than upset the office staff, write your problems up and forward them to Club management, or go over them with the Director of Internal Affairs. This Director can be reached through our headquarters (office) in Happy Camp. You can also find him on our Contact page. Be effective. If you have a problem, please help come up with a solution to fix it! People who are spreading rumors or problems around the membership, who have not made an honest attempt through Ray Koons or Club management to get their information straight or solve the problem, will be called upon by the Director of Internal Affairs. Compared to most other mining areas in the United States, mining rights in our areas of operation are still reasonably unhindered. Our members are generally able to camp and mine in a hassle-free environment. Basically, the reason for this is that we as a group have proven to local communities and agencies that we operate responsibly within acceptable guidelines. Please understand, as long as we are a large group, many eyes will be upon us. Just a few uncaring or unknowing members or guests can give us all a bad name-even when the rest of us are doing things the right way. Public outcry really picks up when just one person in our group is trespassing, creates unsanitary conditions or fire danger in the forest, or is violating many of the other guidelines laid out above-especially the sanitation rules. When one person is seen doing it, they believe we are all doing it! On the long term, if we allow it to happen, just a few could ruin this fantastic opportunity for all the rest of us. So, if you see someone out of line, please take the time to mention it to the person. If that doesn’t straighten it out, bring it to the attention of the Internal Affairs Director so he can fix it. Our entire future as small-scale miners depends upon our willingness to pull together and make the effort to do things the right way. Let’s all contribute to making this a long-lasting relationship and great Club. RULES: The New 49’ers have a set of Operation Rules for all members and guests to follow. These are very reasonable, common-sense rules which are necessary if we are to get along with one another, the local residents and the authorities. These rules are necessary to the continued growth and successful operation of our organization. In the Happy Camp area, we have a very good relationship with the Department of Fish & Game, the U.S. Forest Service and local law enforcement. They have always assisted and supported our activity. This assistance exists largely because they know we are a well organized and responsible group. The purpose of our program is to maintain and increase our existing mining rights while increasing available mining opportunities for our members. The only way this can be accomplished is by doing things the right way and by being responsible for the well-being of the environment in which we find ourselves. We have an enormous amount of freedom to prospect, mine, camp and do other activities because we have always set an example of doing things the right way. We also have a Director of Internal Affairs who keeps track of what’s going on around the properties which we administer. Please see our Contact page if you would like to get in touch with him. Operation Rules are available from the office upon request and are automatically sent to those who wish to join. THE GUEST RULE: A membership includes husband and wife and children under the age of 18. Full Members are allowed to bring guests, and guests can actively participate in a member’s prospecting operation for a one-week period, one time only per guest. Guests must be registered in our office, so they can be issued a pass. If two or more people, outside the membership family unit, are going to operate on Club property for more than a week, it will be necessary for each to obtain a membership. Guests are not allowed to strike out on their own and do their own mining. They cannot claim an area of their own to mine on Club Properties. Registered guests are allowed to help an active member who must be present when mining or prospecting is taking place. A membership entitles a family to actively mine or prospect together. For example, a father and son (under 18 years old) team working a 5-inch dredge together, or a man dredging in the river and his wife shoveling into a motorized sluice on land. ACCIDENT INSURANCE: Prior to doing any work on property administered by The New 49’ers, members and guests are encouraged to have your own accident insurance policy on file with our organization. Or, we have an excellent group policy available to members which provides $5,000 worth of coverage for bodily injury caused by any prospecting accident and resulting independently of any other cause. It is a supplemental policy. This means that if you have some other form of insurance, this policy only covers you when the other runs out. It is good only during prospecting activity and while en route to and from any prospecting activity. It is also a $5,000 life insurance policy if your death is the result of an accident while prospecting. It is an excellent policy for those not having something else to cover you in case of a minor accident. The policy has a $100 deductible and covers $100 per tooth, $500 dental maximum, with a $5,000 maximum limit per injury. The policy currently costs $30 per person, per year (subject to change without notice). This covers from January 1 through December 31. There is no rebate if the policy is purchased later in the year; the fee is still the same. Rates may go up with time. Please contact our office for current rates. SANITATION: When camping on properties which we administer, all grey and black water must be hauled into an approved dump station in town. No holes or latrines are allowed for grey or black water. Portable holding tanks and porta-potties are acceptable, provided they are dumped in approved stations in town. All members and guests must come prepared with some type of acceptable sewage disposal plan if they intend to camp on gold properties which the The New 49’ers make available. We do place chemical toilets in our main, more heavily-used camping areas during the spring, summer and fall months. Otherwise, sewage disposal is the responsibility of each member and guest. We also have a Director of Internal Affairs who keeps track of what’s going on around the properties which we administer. DREDGE AND EQUIPMENT SIZE LIMITATIONS: Before the temporary moratorium was imposed upon suction dredging in California, members were allowed to operate up to 6-inch dredges (hose size) on the creeks, Salmon and Scott Rivers, and up to 8-inch dredges (nozzle intake size) on the Klamath River. Until the moratorium is lifted in California, we are supporting member suction dredging in Southern Oregon. Since most of our members are operating on a small or intermediate scale, and since we already have an abundance of property suited for larger-scale operations, we take extra steps to preserve easier-to-mine property for our members who are mining on a smaller-scale. This is a large factor in our acquisition of new properties. We are constantly looking for new high-quality gold properties. CLAIMING GOLD DEPOSITS: As an active member, you have the right to prospect and mine anywhere along our properties as long as your activity does not seriously inhibit the mining operations of someone who was prospecting in the area first (members or registered guests), and as long as you follow the our Operation Rules. This means, in dredging, if you start mining and cloud-out someone else downstream with your tailings discharge, and the other person was there first, you will have to move elsewhere or make different arrangements so the other operation is not seriously inhibited. If you locate a gold deposit, you have the right to claim the deposit–or at least a portion of it. A person working up on land is entitled to claim a 30 foot radius from the location he or she is actively mining. If you are there first, and another member or registered guest wishes to prospect or mine in the area, please mark your 60-foot circle boundary so they can see where your claim ends. A person must be actively mining or be actively moving equipment to the location in order to claim it. Equipment sitting idle for a week or more constitutes abandonment of any right to claim that area until the person resumes mining activity. If another member starts prospecting activity in any area abandoned by someone else, the new person has a right to claim it. There can be some exceptions to this one-week rule, as in the case when there is an emergency which needs to be handled, or the person is doing some volunteer work for our organization. Special cases must be approved by New 49’er management or by contacting our Director of Internal Affairs. Our intent is to leave all our mining property open to all members, while at the same time giving each individual the right to mine any deposit that you locate. Commercial-scale activities operating on New 49’er property are generally entitled to larger-sized claims. These are negotiated with our management on an individual basis, and claim-rights are maintained by the commercial operation paying the weekly 10% royalty. Individual claims must be marked either with flags on the bank or buoys in the water, placed neatly and in a manner not unsightly or hazardous to other river users. Usually, claims are marked by showing the upper and lower boundaries on the creek or river. Claim markers are used so other members or guests looking for a place to mine can see which areas are already claimed by others. Please remove your claim markers when you leave an area. Claim markers in an area with no equipment present, are not valid unless the person is actively moving equipment to that location. MINING & DREDGING SEASONS IN CALIFORNIA: The State of California recently passed a law which has placed a statewide moratorium on suction dredging in California until the Department of Fish & Game (DFG) completes an updated Environmental Impact Report (EIR). This EIR process has already begun. Under the present schedule, public hearings will begin in November of 2009. DFG is projecting to complete the process by the spring of 2011. Click here for more information. Just in case you didn’t know, this new law only stops suction dredging within California’s active waterways. It does not have anything to do with the other types of prospecting or mining that we do in California. Unaffected prospecting activities include panning, sniping & vack-mining, sluicing & high-banking, booming, electronic prospecting and other types of prospecting that do not use a suction nozzle within an active stream, river or creek. It also does not affect our group weekend projects. SEASON FOR MINING ABOVE THE WATER: Pick and shovel-type above-water prospecting activities can be done along the creeks and rivers at any time of the year; but no silt whatsoever can be washed into the active waterway from water directed up onto the stream bank using a motorized pump. Silt and other material from surface gravels (up on the bank) must remain up on the bank and cannot be washed into the active waterway at any time. Happy Camp has a dry, hot summer and a moist, cool winter season. It seldom snows; but when it does, it usually melts within a few days. River water temperature drops to about 40 degrees during the winter months. During the summer, it runs in the mid-to-high 70’s(F). Some members dredge the Klamath River throughout the winter months, using dry-suits or hot water systems. We also have members who do surface (out of the water) prospecting activities during the winter months in the Happy Camp area. Although, the Arizona winter weather is better suited for outdoor activity during the winter months. In Happy Camp, our season gets busy from early April into November, since this is when most members make use of this area’s mining properties. The New 49’ers is incorporated as a for-profit, private gold prospecting membership organization. The structure is not set up with members having voting rights. However, the organization is administered by successful prospectors who have a sincere interest in providing the best service possible to members. The fact that we are the fastest-growing prospecting organization, with more mining property available to members, more group mining opportunities and more gold coming from our properties than any other prospecting group in the world, is certainly a good reflection upon the intent and ability of our managers. SUGGESTIONS: New 49’er managers are always open to new ideas and constructive criticism. We are also occasionally in need of volunteer help to make improvements and implement new programs. If you have an idea you would like to help bring about, or if you would like to participate in any other capacity, please let us know in the office or by telephone or email. We always welcome help and assistance! If you have disagreements or problems, these can be written down and directed to New 49’er management. Or, you can ,communicate directly with our Director of Internal Affairs. THIS AGREEMENT is made between The New 49’ers, Inc. (hereinafter referred to as the “The New 49’ers” or “New 49’er”), 27 Davis Road, Happy Camp, CA 96039 and the person who is signing this Agreement, enrolling as a Full, Associate or Affiliate Member (hereinafter referred to as “Member”) for the purpose of gaining access to unpatented placer mining claims leased or owned by The New 49’ers (hereinafter referred to as “New 49’er Properties”) and participating in events that are organized, managed or sponsored by The New 49’ers (hereinafter referred to as “New 49’er Events”). Unless specifically qualified, the use of the term “Member” in this Agreement refers to any and all of the three kinds of members. The purpose of this Agreement is also to license the mining rights on New 49’er Properties to the Members on a revocable basis. 1. FULL MEMBERSHIP DEFINED: A “Full Member” is defined as a person the age of 18 years or older, together with his or her spouse, and any of his or her children under the age of 18 years. 2. FULL MEMBERSHIP COST: The cost of Full Membership is outlined on the enrollment contract between Member and The New 49’ers. 3. UNLIMITED ACCESS TO FULL MEMBER: A Full Member, together with his or her spouse and children under the age of 18 years, is allowed unlimited access to the New 49’er Properties and to all New 49’er Events. A Full Member may also bring a guest to the Properties for a one-week period and to the New 49’er Events. 4. ASSOCIATE MEMBERSHIP DEFINED: An “Associate Member” is defined as a person the age of 18 years or older, who is allowed access to New 49’ers Properties for one week per year between the months of May through September. 5. ASSOCIATE MEMBERSHIP COST: The cost of Associate Membership is outlined on the enrollment contract between Member and The New 49’ers. 6. AFFILIATE MEMBERSHIP DEFINED: An “Affiliate Member” is defined as a person the age of 18 years or older, who is allowed access to New 49’er Properties during a two-week outing. Affiliate Groups may schedule a single two-week group outing on New 49’er Properties between the months of May through September. 7. NEW 49’ERS ACKNOWLEDGMENT: Each Member is acknowledged by The New 49’ers as a legitimate small-scale gold miner under the federal 1872 General Mining Law and the applicable provisions of the California Public Resources Code, with permission to conduct mining operations, including but not limited to, locating and developing valuable gold deposits on New 49’er Properties. The New 49’ers further acknowledges that it licenses the revocable mining rights on New 49’er Properties to Members. 8. MEMBER ACKNOWLEDGMENT: Member acknowledges that his or her reason for becoming a member is to belong to an active association, sponsored by The New 49’ers, of small-scale gold miners licensed to mine on New 49’er Properties, for mutual support, and to gain access to more valuable mining opportunities. Member further acknowledges that this license of mining rights on New 49’er Properties to Member is revocable, on the basis specified in Chapter IV, Paragraph 1, Subparagraph (d), below. 1. NEW 49’ER PROPERTY: The New 49’ers shall allow Member access to New 49’er Properties. Most of the New 49’er Properties are located on the Klamath, Salmon and Scott Rivers, and their tributaries, within the general vicinity of Happy Camp, in Siskiyou County, California. A description of all or most of the New 49’er Properties can be found in the New 49’er’ published set of maps and official Claims Guide. 2. NEW 49’ER PROPERTY MAPS: The New 49’ers shall provide maps showing the locations of the New 49’er Properties that are available to Member. Maps of newly-acquired properties are produced periodically as new areas are procured. The latest information about property acquisitions and other New 49’er news can normally be found on the New 49’er’ website at www.goldgold.com. 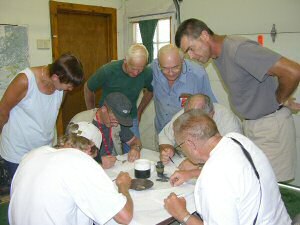 a) During the mining season, The New 49’ers may schedule occasional New 49’er Events in the form of weekend mining programs which provide Member with an opportunity to participate with others in sampling, sluicing (sometimes with motorized pumps), panning, gold cleanup procedures, electronic prospecting and other gold prospecting techniques. b) The General Manager of The New 49’ers on occasion will form joint ventures with individual miners to conduct mining operations, including but not limited to, locating and developing valuable gold deposits on New 49’er Properties. There is normally a participation fee for these particular joint ventures. a) In the areas where New 49’er Properties are located, U.S. Forest Service regulations (Forest Service regulations) in Siskiyou County generally allow persons to camp anywhere within the National Forest (as long as the area is not posted as a “no camping” area) for up to 14 days without the need for any permits or notice to anyone. In addition to the normal 14-day allowance to visitors, The New 49’ers may have designated New 49’er long-term campgrounds (meaning that Member can stay there longer than the normal 2-week limit) on or near New 49’er Properties. b) The federal 1872 General Mining Law provides additional rights to miners for occupation of mining claims consistent with Forest Service regulations. Member is responsible for complying with Forest Service regulations and communicating as necessary with Forest Service personnel, if Member chooses to camp at any location on the New 49’er Properties outside the New 49’er long-term campgrounds for more than two weeks. a) Depending upon the impact-level of Member’s intended operations, independent approval may be required from the U.S. Forest Service or other government agencies. In this event, Member shall file his or her own Notice of Intent (NOI) or Plan of Operations (PoO) with the appropriate ranger districts, if required; and Member shall otherwise comply with Federal, State and local regulations concerning mining. b) It is understood and agreed that mining opportunities provided to Member by The New 49’ers may only be exercised in accordance with applicable laws and regulations; and The New 49’ers cannot be held liable for laws or regulations that pertain to mining or changes in the interpretation by a court or agency of the laws or regulations that pertain to mining that could result in a reduction of mining opportunities on New 49’er Properties. a) The New 49’ers fully expects that Member will be able to recover some gold from the New 49’er Properties if he or she makes a reasonable effort to do so. b) The New 49’ers cannot guarantee how much gold Member will recover from New 49’er Properties. c) The Klamath, Scott and Salmon Rivers are proven gold-bearing rivers. Generally, the Member can expect to recover gold in proportion to the extent that he or she applies himself/herself in prospecting and mining activity on New 49’er Properties. 1. MEMBER MINING RIGHTS UNDER LICENSE: By executing this Agreement with The New 49’ers, Member obtains a revocable license to the mining rights on New 49’er Properties, which permits the Member to conduct mining operations, including but not limited to, locating and developing valuable gold deposits on New 49’er Properties. 2. MEMBER RIGHT TO KEEP GOLD PRODUCED: Providing Member is within the other provisions of this Agreement, Member may keep all gold production from his or her operations along New 49’er Properties; with the exception that for any operations using mechanized earth-moving equipment such as bulldozers and backhoes or suction dredges with hose-sizes larger than 6-inches in diameter, Member is required to pay The New 49’ers a 10% royalty of gross gold recovery, regardless of how much or little Member is producing. This 10% royalty shall be paid by Member to The New 49’ers on a weekly basis, on or before Wednesday for all gold recovered on or before the preceding Sunday. 3. MEMBER RIGHT TO CLAIM GOLD DEPOSITS: When a Member chooses to develop a deposit on New 49’er Properties, he or she has the right to claim a portion of such deposit to the exclusion of other Members. 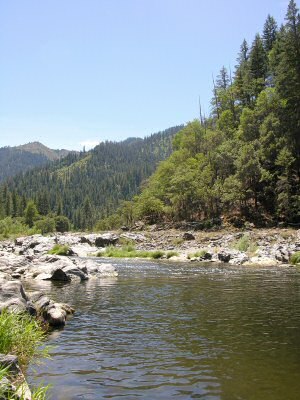 Member is entitled to claim 60 linear feet of the creek or river at one time (but only from one bank to the center of the Klamath River), or a 60-foot diameter circle area if mining on the surface. Member must be actively mining or be actively moving equipment to the location in order to claim it. Equipment sitting idle for a week or more constitutes abandonment of any right to claim that area until the Member resumes mining activity. 4. MEMBER RIGHT TO TRANSFER OWNERSHIP: An active Full Member’s membership credit can be given or sold to another person. There is a $50 transfer fee which is payable to The New 49’ers at the time of transfer. Annual membership dues must be paid to date for a Full Membership to be transferred. 5. OTHER MEMBER RIGHTS AND PRIVILEGES: Member shall also have the right to avail himself/herself of the privileges The New 49’ers provides, as set forth in Chapter II, paragraphs 1 through 6, above. a) The New 49’ers has a set of “Operational Rules for Members and Guests” (hereinafter referred to as the “Operation Rules”) for all Members, as well as the respective Members’ spouses, children and guests. b) Member agrees that the most current set of Operation Rules and Operating Guidelines for specific New 49’er Properties are a continuing part of this Agreement and these are incorporated by reference. Member agrees that continuation of the license granted under this Agreement, and continued active membership in the miners’ association sponsored by The New 49’ers, requires Member to adhere to the Operation Rules and any Operating Guidelines that apply to any New 49’er Property on which Member is conducting operations. c) Member acknowledges that he/she has received a copy of Operation Rules and the Operating Guidelines applicable to specific New 49’er Properties. Member shall carefully read the Operation Rules and the Operating Guidelines applicable to any New 49’er Property on which Member plans to operate and conduct himself/herself in accordance with these Operation Rules and Operating Guidelines at all times while being present on or around New 49’er Properties, or participating in New 49’er Events. d) If it should come to pass that New 49’er Management determines (in the sole judgment of New 49’er Management) that Member has violated the Operation Rules and/or applicable Operating Guidelines, Member agrees that New 49’er Management has the right to temporarily suspend or permanently revoke the Member’s rights, including Member’s license of mining rights, depending (in the sole judgment of New 49’er Management) upon the severity of the violation. In the event that New 49’er Management temporarily suspends or permanently revokes a Member’s rights due to Operation Rule or Operating Guidelines violations, Member agrees to abide by New 49’er Management’s decision until such time as the matter can be reviewed in a court of competent jurisdiction. e) Member understands that the Operation Rules are general operational guidelines for New 49’er Properties and other activities which have been included within NOIs or PoOs accepted or approved by the U.S. Forest Service over a period of time. Some New 49’er Properties may not be included within accepted NOIs or approved PoOs. Member acknowledges that he or she has received a copy of The New 49’er current Claim’s Guide, and agrees to read and abide by the specific Operating Guidelines concerning each New 49’er Property before proceeding with a prospecting or mining program. 2. MEMBER IS AN INDEPENDENT MINER: Member acknowledges and agrees that Member joins The New 49’ers as an Independent Miner to obtain a revocable license of mining rights on New 49’er Properties, and is free and responsible to conduct his or her own mining operations along New 49’er Properties in any way he or she decides to, providing New 49’er Operation Rules and Guidelines are followed, and Member’s mining operations adhere to State, federal and local law. Member agrees that meeting such obligations is completely the responsibility of the Member. 3. COMMERCIAL OPERATOR: A “Commercial Operator” is any New 49’er member who operates mechanized earthmoving equipment such as bulldozers and backhoes or suction dredges with hose-sizes larger than 6-inches in diameter on New 49’er Properties. Commercial Mining License Agreement must be signed by Member and The New 49’ers before Member may become a Commercial Operator. a) Member expressly agrees that his or her active participation in mining or prospecting or other outdoor activities can be potentially dangerous to Member, Member’s spouse, children and guests; and Member agrees to use good judgment to not place Member or any other persons in danger. As a result of Member’s past experience in outdoor activities, Member certifies that he/she is personally qualified to make good judgment in these matters. managers, instructors, Event leaders, assistants, agents, attorneys, and/or employees and/or claim owners (individually and/or severally hereinafter referred to as the “New 49’er Agents”) shall not be liable, jointly or severally, for any injuries or losses to the person or property of Member. Member also agrees to indemnify and hold harmless New 49’er Agents from and against any and all actions, claims, demands, liability, loss, damage and/or expense of any kind, including attorney’s fees arising from any such claims. c) Member personally assumes full responsibility for any injury, loss or liability, including but not limited to, loss of life, limb, health, employment and/or sight, which may result, or be alleged to have resulted, from Member’s, or Member’s spouse’s, children’s, or guest’s participation in New 49’er Events or activities on New 49er Properties. d) Member agrees that in the event of sudden illness or injury to Member, or to Member’s spouse, children or guests, Member authorizes The New 49’ers or New 49’er Agents, any hospital, doctor, emergency personnel, or those persons who are present, to render immediate emergency aid or other assistance at the time, as conditions and experience will allow. Member will hold harmless any such person(s) who attempts to assist him/her, and understands and agrees that any financial expense from such emergency or medical services will be Member’s personal responsibility to pay. e) Member acknowledges that group accident insurance has been offered to Member by The New 49’ers. 5. MEMBERSHIP PAYMENTS: Member must maintain Membership payments up to date in order to actively mine on New 49’er Properties. A Member who chooses to participate as a Full Member under the monthly payment plan must keep installment payments current to maintain active status and enjoy the benefits outlined hereto. Any Member who falls three months or longer behind on installment payments may be dropped from active status as a Full Member, and all rights outlined hereto will be rescinded, upon notice by The New 49’ers, mailed to the Member, as set forth in Chapter V, paragraph 1, below. 6. YEARLY DUES: Full Members must pay annual dues of $50. Annual dues must be paid in order to keep Full Member on active status with The New 49’ers. 7. COMMITMENT: There is no contract binding Member to continue installment payments if Member chooses to drop out of the association. To drop out, Member shall notify The New 49’ers by mailing his or her Membership card along with a note to that effect to The New 49’ers; and Member’s active membership will terminate as of the date mailed, as set forth in Chapter V, paragraph 1, below. 8. RELEASE: Member agrees that pictures or video-footage may be taken of Member and Member’s spouse, children, and/or guests while Member is active on New 49’er Properties, or while Member is participating during New 49’er’ Events. Member hereby grants The New 49’ers permission to freely use such pictures or video footage within any future New 49’er promotional or other materials. 1. NOTICES: Any notice or other communication (“Notice”) required to be given under the terms of this Agreement shall be in writing and shall become effective when personally served upon the party to be given such Notice, when posted by certified or registered mail, return receipt requested, or when delivered by telex, telegram, telecopier or other wire service. THE NEW 49’ERS: P. O. Box 47/27 Davis Road, Happy Camp, CA 96039: (530) 493-2012; Fax: (530) 493-2095. 2. GOVERNING LAW AND VENUE: This Agreement is to be governed by and construed under the laws of the State of California and the federal 1872 General Mining Law. The New 49’ers and Member consent to litigate any dispute under this Agreement in the Siskiyou County Superior Court, unless the dispute concerns a specific New 49’er Property in another county, in which case either The New 49’ers or Member may elect to litigate that dispute in the superior court of the county in which The New 49’er Property is situated. 3. SEVERABILITY: Any provision of this Agreement prohibited by the laws of the United States or the State of California shall be ineffective to the extent of such prohibition without invalidating the remaining provisions of this Agreement. 4. ATTORNEYS FEES TO PREVAILING PARTY: In any litigation over this Agreement, the prevailing party (either The New 49’ers or the Member) shall be entitled to reimbursement of reasonable attorney’s fees and costs incurred from the other party. 5. EFFECTIVE DATE: The effective date of this Agreement shall be . The parties hereto have executed this Agreement on the date set forth hereafter. The truth is that, the way things are, I probably worry about the “Resistance is futile, I want to look at your ?&$# ???? ?” scenario more than anyone!! Not in the Club; but in a world where government gains more control over our lives every day. Those guys are also looking more and more at our activity every day. It’s the reason why we must all have our acts together. “Internal Affairs” sounds pretty scary. We were using “Welcoming Committee” for a while; but it doesn’t really describe the function. One problem is that there is a very small percentage of people who will not conform to any set of reasonable rules or conform to acceptable civilized behavior. When they show up in our program, we must have a way to deal with them, or they place the whole program at risk. We have run several people out of the Club over the years, mainly because they were basically criminals. We don’t want the bad guys around. Our “Internal Affairs” guys are volunteers who I have personally appointed. Most of the time, they are just doing their own thing (prospecting) like any other members. 1) Disputes between members, or between members and locals or the authorities. This doesn’t happen very often. Sometimes it is about crossing over some local private property without permission. Once in a while, members can have a dispute about a private mining area on our properties; who was there first, etc. Our guys help solve these kind of problems when they come up. 2) Uncivilized behavior out on the mining properties or in the campgrounds. There is no call for a single person to make the overall experience miserable for everyone else. Some people exist who can be vocally unfriendly to everyone else in the viscinity. Maybe someone’s dog turns out to be a menace. Things like this sometimes need to be adjudicated by Club staff with some authority, although it is almost never necessary in The New 49’ers. 3) The main concern ties to the concept of “substantial surface disturbance.” Our entire legal foundation with the authorities revolves around this single concept of keeping our cumulative surface impact to a minimum. This is because, if we exceed a minimum standard as a group activity, each individual member will find yourself negotiating your own terms with the authorities. Believe me; it is much easier for everyone involved if we can just internally manage our own affairs! We have managed to accomplish this every season since 1986. But sometimes, it has been necessary for our Club staff to ask or help active members reduce impacts which exceed reasonable standards. Reasonable standards are all outlined in our published Rules. Some of our individual properties have some special operational limitations. When they exist, you will find them explained in ourClaims Guide. Under my personal direction, our Internal Affairs guys are continuously monitoring our overall cumulative impact. This is where the 10 dredges per mile concept comes from along the Klamath River. It is where the need for self contained toilet facilities comes from. Most of our published rules revolve around agreements which we have made with the authorities about how we can keep our cumulative surface impact to a level which is considered less than significant. I tell members not to worry about it too much; people come and go in a matter of days. Sometimes in a matter of hours! Everybody will get a chance. We have 60+ miles of opportunity available. There is plenty of room for everyone! Big holes dug on the bank, or dredged into the bank, are another big one. This is because the cumulative impact from these could easily be classed as a “substantial surface disturbance,” and place our entire self-managed program at risk. You would be surprised at how many people just walk away from open holes! You know who fills them in? It’s the Internal Affairs guys (volunteers)! Sometimes the holes are big enough that they have to organize work parties to fill them in. We had one member who made a huge hole in the stream bank once, right next to the river. Then she refused to fill it in. So our Internal Affairs guys arranged for others to fill it in. Then we wrote a formal letter to that member which cancelled her right to do any further high-banking on our properties. She wasn’t very happy about that. And I was sorry to sign the letter, because she is a very nice lady. Some things are not easy! Fortunately, in our group, disciplinary action is almost never necessary. The vast majority of members do their best to minimize impact. We have a great bunch of members! The rules are all reasonable, common sense solutions which have evolved over the years — mainly because somebody was doing something that was going to get us in trouble. We could not exist without the rules. The good thing is that we have volunteers to take care of these things, so I don’t have to be walking around with a trash bag in one hand and a megaphone in the other! Thanks for trying to understand!